Sometimes the desire courses through my veins. I literally get antsy and feel the need to lace up my shoes. Other times I can go days without hitting the pavement. However, regardless of the regularity, I consider myself a runner. These days when I run I'm pushing a jogging stroller so it's much different than the days of olde’ when some earbuds and good shoes were the only things I worried about for a successful jog. Making time to run can sometimes be difficult so I run varying times of the day - morning, noon and night. Okay, maybe not morning but the rest of them still apply. The more I get out there and run, the more I realize how little others think of us runners. There is a blatant disregard for our comfort and more surprisingly, our safety. Obey traffic laws - My number #1 concern as a runner is my safety and the safety of my child(ren). I want to know that I can get some exercise and enjoy the fresh air without having to worry about being hit by an inattentive driver. With the concern over hands-free driving these days, motorists are even less likely to take notice of the things happening around them - including runners, bikers, and walkers. Please come to a full stop at a stop sign. Please give the right of way to pedestrians. Please share the road with cyclists. Please realize that while you sit behind the wheel of a powerful vehicle, we are exposed and vulnerable. Keep your vegetation off the sidewalk - Okay, maybe this one is a little petty but the sidewalks are meant for the public good not for your overgrown bushes. I absolutely hate it when I have steer my stoller off the sidewalk onto the road because you let your wildlife become unruly. Please take a moment and use a hedge trimmer. Just clip those bad boys back so that your friends and neighbors can take a stroll and stay on the sidewalk. Keep your animals on a visible leash or contained within a VISIBLE fenced area - Animal lovers I acknowledge you and I know you love your fur babies. I love my babies too and I'd prefer not to have a heart attack on my next run. I cannot tell you the number of times that a dog has bolted out of nowhere and run straight at me and my kids while I've been running. I can't see your invisible fence. I don't know that your dog is highly intelligent and is obedient enough not to leave your yard. All I see is a dog running at me, full speed and barking wildly. It scares me and it scares my kids. I naturally get defensive. This has happened so many times that sometimes I carry mace while I run. I don't want anything to happen to myself, my children or your animals so it's in the best interest of everyone if you could contain your pets by way of leash, fence, backyard or dog pen. Use the sprinkler system to water grass not concrete - One of the many reasons I love to run is because I get to enjoy looking at the beautiful scenery as I pass, and that includes your lush green lawn. I appreciate the time and energy it takes to have a lawn that looks as good as yours but it is unnecessary to water the concrete. If you have a permanent sprinkler system just make the adjustment so that you aren't wasting water and you aren't drenching runners. Keep your trash in the neutral zone - Trash pickup may only be once a week but when you take your trash cans out to the curb please put them in an area that isn't used by runners. Zigzagging on and off the sidewalk because of the trash just stinks (pun intended). Clean up the poo - If your animal chooses to relieve itself on the sidewalk do us a solid and bag it. I don't want poo on my shoe - gross. 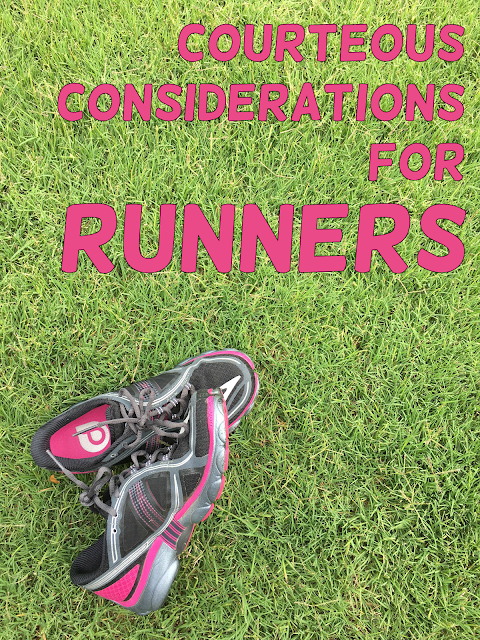 I'm not asking people to go out of their way for the convenience of a few of their neighborhood runners. Really what I'm asking them to do is to think about their fellow neighbors and try to embrace habits that will make their living areas more walkable and exercise-friendly. What are some of your biggest pet peeves as a walker or runner? This post made me laugh, as most of them happen to me when I'm out running. My pet peeve is overgrown bushes, having to run in the road is not ideal! I totally agree with having respect for others they cleaning up the doggie do. It's just common courtesy to use a doggy bag well you and your pooch are out walking. Hehehe totally made me giggle. I'm not a runner but my daughter and I take nightly walks and omg... Poo everywhere -_- pick it up people.